With our managed web site plans, you don't need to know your php from a cgi. We can help you keep an up-to-date site, while cutting your IT costs. This position may grow into a part or full time position. Please, no high-priced designers or those new to Web design. Do not send samples, just URL links. If you can not publish your work online, then this is not the right position for you. 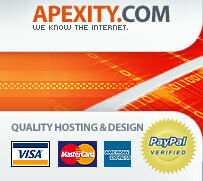 Please e-mail resume and links to jobs@apexity.com.